Asian markets are trading higher especially Nikkei jumped more than 1%. 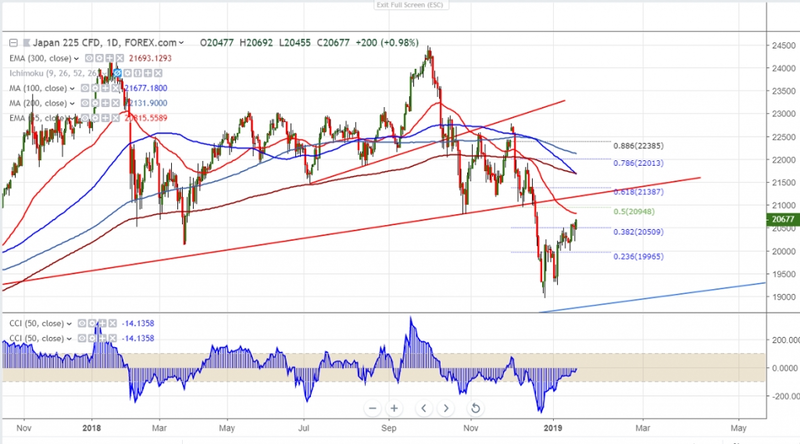 US markets was closed higher and has closed well above 55-day EMA first time since Dec on US-China trade optimism.The Wall Street Journal reported on Thursday that US Treasury Secretary Mnuchin discussed lifting some or all tariffs imposed on Chinese imports. Dow Jones closed at 24370 (0.67% higher) and S&P500 2635 (0.70% higher) . Shanghai is trading slightly higher and is currently trading around 2579 (0.79% higher). Nikkei is trading at 20669 (0.88% higher). USDJPY has jumped more than 70 pips from yesterday’s low of 108.68. Minor weakness can be seen below 107.50 and any violation below targets 106.80/106. It is currently trading around 109.35. On the lower side, near term support is around 20200 and any break below targets 19900/19600/19000. The near term resistance is at 20845 (55 - day EMA) and any break above targets 21000/21300. It is good to buy on dips around 20400 with SL around 20200 for the TP of 20840/21000.